A wildly original, fantastical adventure—and now an animated move, Jack and the Cuckoo-Clock Heart—this international bestseller will charm readers of all ages. Edinburgh, 1874. Born with a frozen heart, Jack is near death when his mother abandons him to the care of Dr. Madeleine—witch doctor, midwife, protector of orphans—who saves Jack by placing a cuckoo clock in his chest. And it is in her orphanage that Jack grows up among tear-filled flasks, eggs containing memories, and a man with a musical spine. As Jack gets older, Dr. Madeleine warns him that his heart is too fragile for strong emotions: he must never, ever fall in love. And, of course, this is exactly what he does: on his tenth birthday and with head-over-heels abandon. The object of his ardor is Miss Acacia—a bespectacled young street performer with a soul-stirring voice. But now Jack’s life is doubly at risk—his heart is in danger and so is his safety after he injures the school bully in a fight for the affections of the beautiful singer. Now begins a journey of escape and pursuit, from Edinburgh to Paris to Miss Acacia’s home in Andalusia. 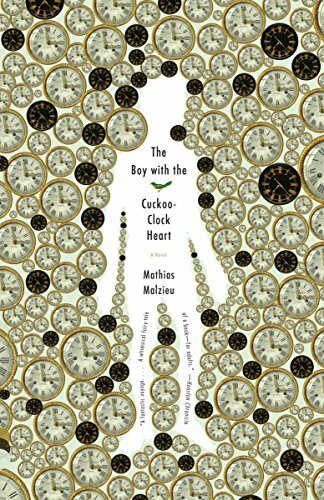 Mathias Malzieu’s The Boy with the Cuckoo-Clock Heart is a fantastical, wildly inventive tale of love and heartbreak—by turns poignant and funny—in which Jack finally learns the great joys, and ultimately the greater costs, of owning a fully formed heart. If you have any questions about this product by Vintage, contact us by completing and submitting the form below. If you are looking for a specif part number, please include it with your message.